LONG ISLAND, NY (November 14, 2017) – In less than 60 days from its release, BIGFOOT 4X4, Inc. and Kollectico have SOLD OUT of their first line of Limited Edition Collectible bobbleheads inspired by BIG-FOOT #1, The Original Monster Truck®. 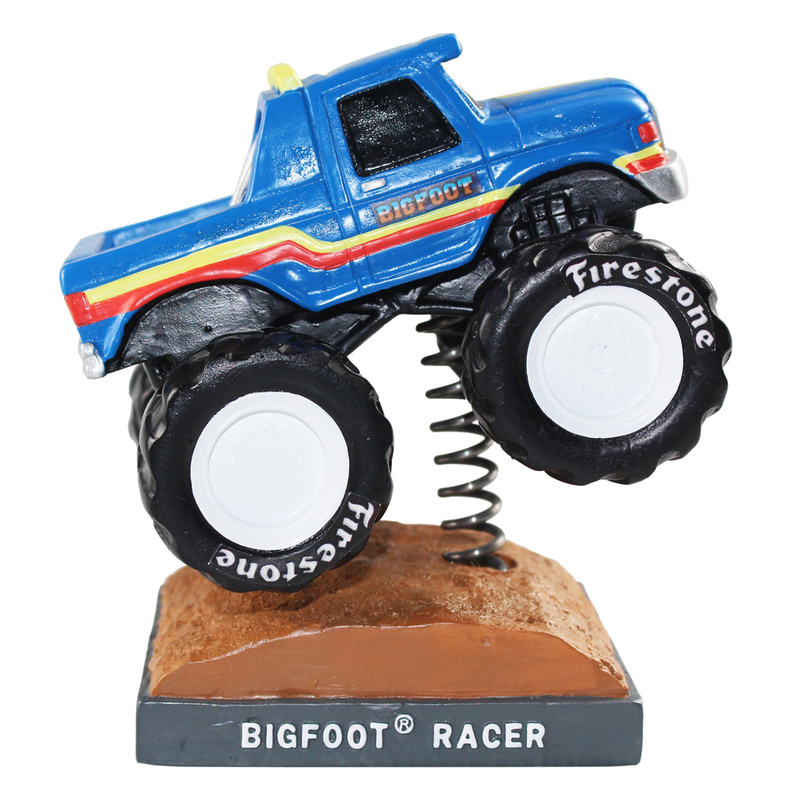 The second line of the Officially Licensed BIGFOOT® bobblehead collection arrives just in time for the Holidays featuring BIGFOOT Racer, which not only ‘bobbles’ but its monster tires also spin. The BIG-FOOT Racer bobbleheads are individually numbered, 100% handmade, hand-painted and packaged in full color Collector window boxes. “We are thrilled with the success and sell out of BIGFOOT #1 and even more excited about BIGFOOT Racer for the Holidays. The Original Monster Truck is such an iconic piece of history that we have to require exceptional innovation and quality. Kollectico has been great to work with and their attention to detail is extraordinary. We are looking forward to many more projects in the years to come,” said Ann C. Trent, President of BIGFOOT 4X4, Inc. Located in Long Island, NY, Kollectico is one of the world’s largest manufacturers of bobbleheads with 13+ years’ experience. The bobbleheads are 100% hand sculpted and hand-painted for the highest quality. Kollectico has licenses with the NHL, Discovery Communications, WWE, Professional Bull Riders and more. For more information visit www.Kollectico.com. Since its inception in 1975, BIGFOOT has been named one of the “Top 5 Marketing Vehicles of All Time,” and its worldwide notoriety led to the creation of the entire Monster Truck industry. Today the team campaigns 9 full-time trucks, mostly in North America, and sees more than 4 million fans live at its 700 to 800 appearance days per year. 3 million BIGFOOT toys were sold in 2014 and 2015. In late 2016, BIGFOOT appeared in probably its most exciting and inspirational events yet – 2 set of Car Crushes in Kuwait at a US military base for the troops as part of the Armed Forces Entertainment/Summit Racing Equipment/NHRA Exhibition BIGFOOT Tour. Visit the team online at www.bigfoot4x4.com. Copyright 2017 - 2019 Kollectico. All Rights Reserved.